Outlook and .tel – changing jobs just became easier! With the constant stream of grim economic news about layoffs, bankruptcies and closures it’s not difficult to wonder if the axe is going to fall on you next. So do you jump or do you wait? If you get laid off, you have to tell all your friends, family members, professional associates and clients that you can no longer be reached at your work email and phone. If you are lucky enough to get another job, you have to tell all your friends, family members, professional associates and clients that you can now be reached at your new work email and phone. I don’t know about you, but I never put people’s email addresses in my Contacts in Outlook anymore. The nickname or autocomplete feature has taken away the need for that. I type a letter or two and it shows me a list of names to choose from. So now I am either at home or at my new office and I have to re-type all of the info into the address bar and send out the email that I can now be reached at the following address and phone. Sure, I might have been a clever clogs and copied my .nk2 file from my old machine and copied it onto my new machine, thus preserving my nicknames, but how many people remember to do that? Employed or unemployed, there has to be a better way. .tel shines a much needed beacon of hope onto the whole mess. I have lisa.tel. All my friends have laura.tel, dave.tel, suzi.tel etc. We are “friended” within the Telnic TelHosting system. I arrive at my new job and I install the .tel Outlook tool (there is a beta version available from Telnic at the time of this writing). I log in via the tool and all of my friends’ information comes down into my Outlook. I don’t have to type their addresses in from a list. But wait – it gets better. I don’t have to email them that I have a new job. When they log into their Outlook in the morning, the .tel Outlook tool goes out to the TelHosting platform and polls to see if there are any changes. Your new email address that you updated the night before, comes zooming down into their Outlook. They might not catch on for weeks that the address they are sending to has changed. Your name comes up, they email you, you keep responding to dinner invites. 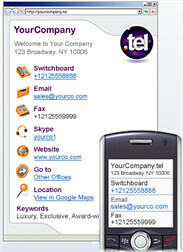 With .tel, staying connected just got easier.